[Via Satellite 06-25-2014] Aerojet Rocketdyne successfully performed a series of hot-fire tests on a Bantam demonstration engine made entirely through additive manufacturing. The engine consisted of only three additive-manufactured components: the injector and dome assembly, the combustion chamber, and a throat and nozzle section. This engine is normally comprised of dozens of parts. This liquid oxygen/kerosene engine, called “Baby Bantam,” is at the lower end of the Bantam engine family thrust range, with a thrust of 5,000 pounds. The Bantam family goes all the way up to 200,000 pounds of thrust and can be adapted to different fuels such as kerosene, ethanol, methane and storable propellants. In addition to reducing the cost of the engine by about 65 percent, the team was able to reduce total design and manufacturing time to a couple of months, when it would usually take more than a year for this kind of engine. “We are not just making a stand-alone chamber or injector derived from traditional design approaches. 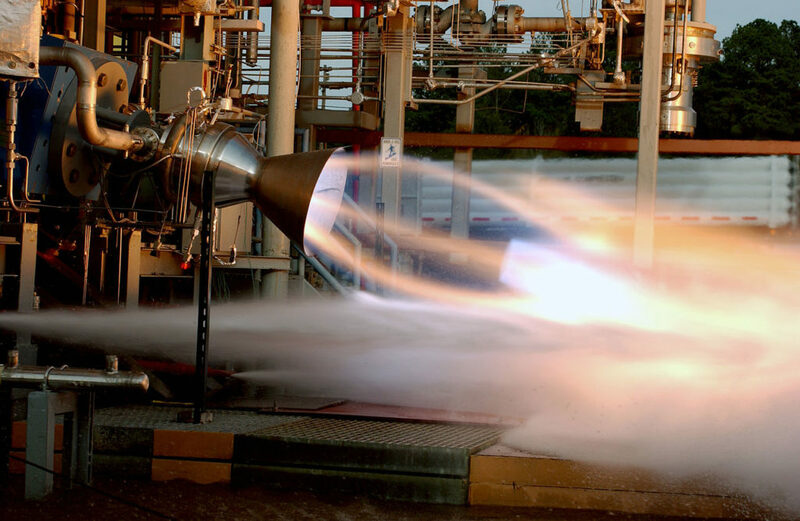 Rather, we are integrating the full capability of additive manufacturing processes to evolve a proven, reliable, affordable design,” said Jay Littles, director of advanced launch propulsion programs at Aerojet Rocketdyne.